We are delighted to have been awarded the Feefo GOLD Trusted Service Award 2018. As a small, family run, independent firm; delivering a high quality, personal customer service is our very top priority. We have always stayed true to our heritage and still to this day, follow our local traditional working methods. Being a close-knitted company, we believe this works in our favor: providing quality service to all of our customers is essential. 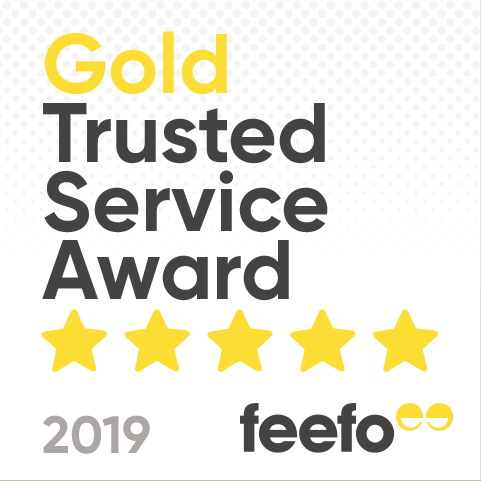 So, we are delighted that Feefo has now awarded us with their Gold Trusted Service for our customer service experience. Our fine lacy knitting has been available on-line for several years now and our international customer relationships are ever-growing. The challenges of different cultures and languages knows no bounds, as each individual requirement is always taken with great earnest. From our hands to yours. The Super-fine Merino Wool Christening Shawl featured in our Luxury Gift Wrapping. "Getting everything right for the customer is a team effort” notes Director Gillian Taylor. “It takes up to 2 days to make a shawl here at our Shawl Factory, in Nottingham. Each knitted item is handled by up to 8 different pairs of artisan hands: Knitting; washing; finishing; packing; dispatch. We also think of our suppliers as part of the team. From yarn to labels to packaging, to knitting machine parts to web based IT services. Most of these are long standing relationships and still local to us in and around Nottingham”. At the end of the process, we then hand over the customer’s order to a shipping partner, who makes sure their parcel is delivered promptly to their address. “When you think about it - the chances for things to go wrong - it's a miracle really, that everything works so well” jokes Gillian. Gillian (right) presenting Anne (left) with the Feefo GOLD Trusted Service Award, 2018. With 17 years’ worth of experience at G. H. Hurt & Son, Anne Tagg is the leader of our customer service efforts. So, it was only fitting for Anne to receive this award on behalf of all the staff at G. H. Hurt & Son. “We do occasionally see negative reviews. Which is a good thing really, as it gives us a chance to resolve a potential problem. We also learn a lot from our customer’s experiences. We always do everything we can to sort any issues when they do arise. Sometimes things can and do go wrong. A parcel gets lost. Maybe someone isn’t home when a delivery is attempted. Or a colour isn’t exactly suitable, etc. We like to think it’s what we do next that really counts”, says Anne. Throughout our many years of trading, we at G. H. Hurt & Son pride ourselves on offering an exceptional customer service experience. No reasonable request or question is too challenging, whether its regarding shipping dates, product care or matching our wool baby shawls to the colour of a family heirloom christening gown. It is imperative to us when our customers email or call with an enquiry, our staff can provide an in-depth understand of our products with first-hand experience. Feefo’s service rating is based on a customer feedback, and we are delighted to have been rated 5 out of 5 for our service. Before leaving a review, customers follow a verification process to ensure they’re genuine and have completed a transaction prior to the review. Once this is complete, they’re independently invited to provide an appraisal by Feefo. This method ensures an honest representation of customer opinions, which helps us to address any issues a customer has or appreciate any praise they have provided about our service. Reviews from previous customers are displayed automatically under our products and are available across the website. Gillian Taylor, commented: “We are particularly delighted with this award as we only started using Feefo customer services a year ago. So, to win their top award in our first year is outstanding. We feel this reflects our ongoing commitments to customer service”. And the certificate has pride of place in our office. So, a massive thank you to all our customers for both their business and their valued feedback.